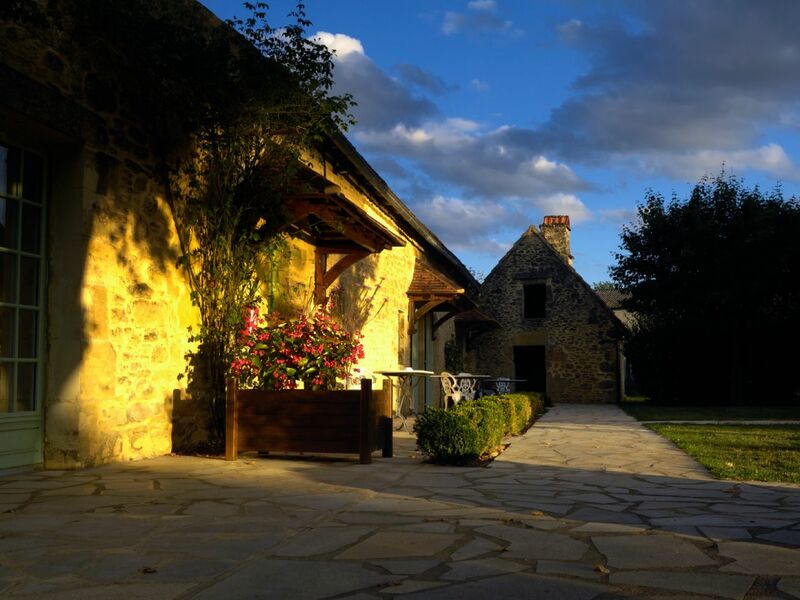 “Dear Ruth, Carole and I recently returned from our Dordogne Tour and wanted to let you know that we really enjoyed the trip – even better than lasts year's tour in Provence, though it too was heavenly. 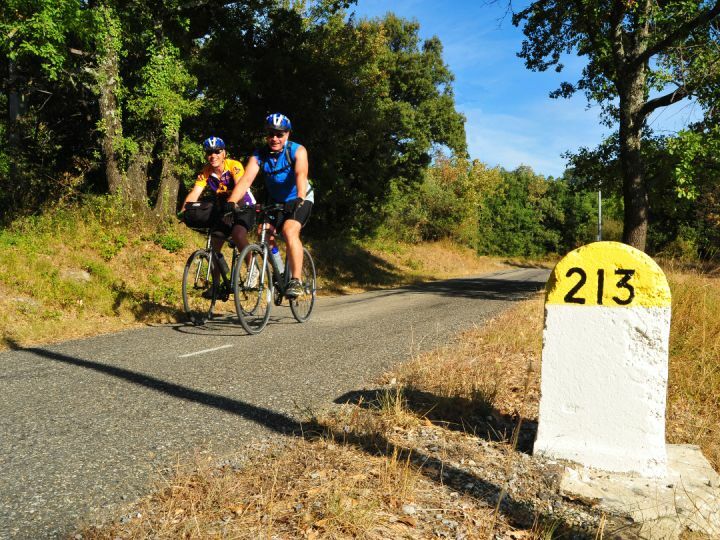 The Dordogne tour was in all respects PERFECT!" Pick ups are from Brive-la-Gaillard station (direct trains from Paris Austerlitz and Toulouse). By arrangement we can also collect Brive airport. For the recreational cyclist who feels comfortable riding between 40 km and 60 km a day. 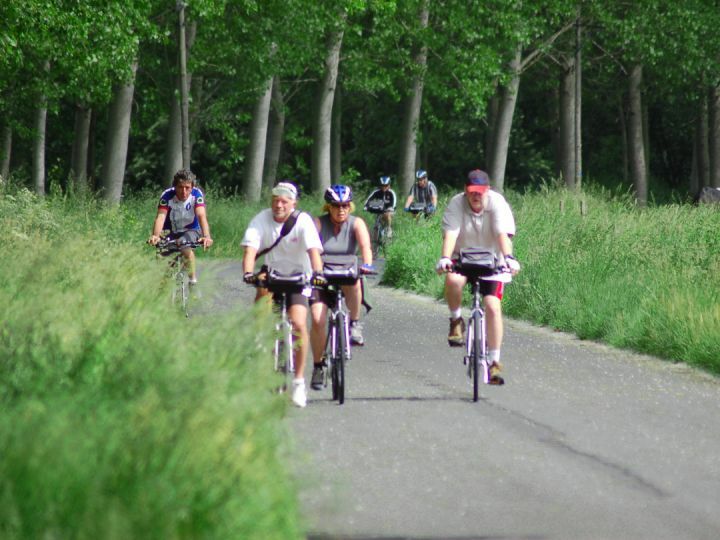 The terrain can vary between flat, rolling and climbs of a few kilometers in length. 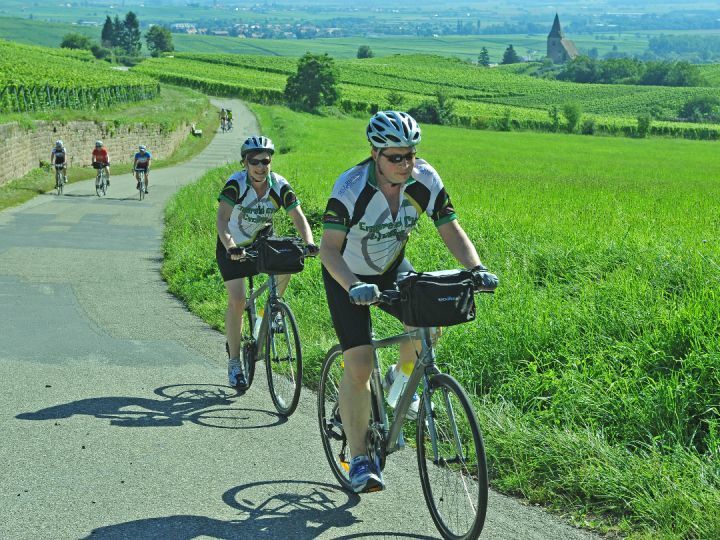 This type of tour would be ideal for someone who has a good level of cycling fitness and who enjoys riding for riding’s sake! The Dordogne is a region immersed in the past. The caves of Lascaux are home to some of the finest examples of pre-historic art and the area is dotted with Cro-magnon caves and settlements. The area, known to the French as the Périgord, changed hands between England and France several times during the hundred years war resulting in the building of many bastides or fortified villages. The village of Rocamadour was an important waypoint for pilgrims making the long journey to Santiago de Compostella and there are many fine medieval churches along the route of our tour. In addition to this wealth of history the area is blessed by its stunning landscapes of rivers and cliffs, hills and fields of sunflowers and tobacco. The medieval villages are built from golden limestone with the steeply pitched roofs typical of the region. The rich countryside is reflected in the cuisine of the region, famous for its duck and goose dishes, including the celebrated fois gras, its truffles and its cheeses. The area also has its own wine appellations, from the light and fruity Bergerac and Pecharmont in the north to the dark and powerful Cahors in the south. Our itinerary has been created to show off the best of this varied and fascinating region. The rugged countryside is reflected in the itinerary , but the route has been designed to ensure that each day’s riding will be manageable (and rewarding!) for anyone with a reasonable level of fitness. Transfers are from Brive-la-Gaillarde. Our hotel in Aubas overlooks fields of deer and sheep running down to the River Vézère and here we make sure everybody is fitted with their bikes; a limbering up ride will take us to the village of Montignac, with buildings dating from the fourteenth century, and the new visitor centre housing the fantastic Lascaux Caves exhibition, where cave art representing the prehistoric civilisation of 15,000–20,000 years ago is hauntingly displayed in a new high-tech installation. Afterwards we head back to the hotel where a quick swim in the pool before dinner might be enticing. Dinner is at the hotel where we will look forward to the week ahead. Our first full day in the saddle takes into the heart of prehistoric Perigord. 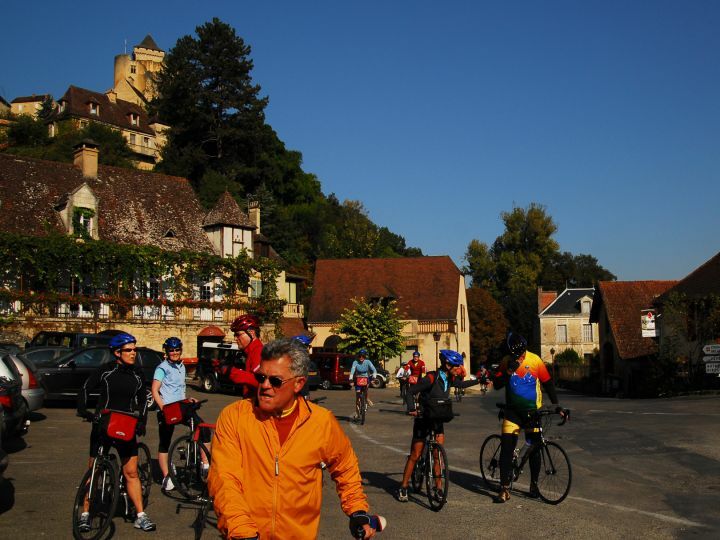 The road leads along the River Vézère, past the magnificent Château de Losse to the pretty village of Saint-Léon, a fitting place to stop for a coffee. The next stop on our journey is Roque St-Christophe, a fascinating site of dwellings carved from the cliff face dating back to Roman times and beyond. After lunch we follow the River Vézère as it meanders downstream towards its confluence with the Dordogne. A little climbing brings us to the village of Meyrals and thence to our secluded farmhouse hotel in the Dordogne countryside. You are treated to a home cooked meal tonight from our lovely welcoming hosts! Today is a busy day! We descend to the river Dordogne at the pretty town of Saint-Cyprien, with its 12th C Abbey-Church. Crossing the Dordogne, we stay on the south side of the river, following the Dordogne to a visit of Chateau des Milandes ( former home to Josephine Baker, the chateau’s most famous resident). Francois de Caumont, original owner of the castle, had the chateau des Milandes built in the 15th century for his young wife, who found his original 12th century Chateau Castelnaud rather cold and unwelcoming, (Nothing to do with the English who had control of the castle in the Hundred years war.!) Time permitting, after leaving Chateau Milandes you can make the comparison yourself to make the steep climb to the Castelnaud. From its battlements you can gaze across the river to the Chateau de Beynac, its French-held counterpart., standing on a cliff overlooking the village — the castle is protected by the 150 metre sheer drop to the river below. After a breathtaking descent, we climb to visit the bastide town of Domme. The hill-top bastides were built during the 100 Years War as fortified strongholds, built in a grid pattern around a central square. Many of them changed hands several times from English to French control and back again. In the afternoon we cross back to the north, following rolling backroads into the regional capital, the stunning town of Sarlat. One of the best-preserved medieval centres in France, the golden limestone used for the buildings gives the town a wonderfully warm atmosphere. We stay either 1km outside of town or in town depending on the time of the year. Tonight we are staying in Sarlat again, so there is no need to pack up. There are 2 options today. One can stay in Sarlat and head back to the hotel at their leisure or take a short ride back to the Dordogne and enjoy a canoe trip downstream, passing through the beautiful town of la Roque Gageac and floating by the chateaux of Castelnaud and Beynac (which has been used as a backdrop to many movies set in medieval times, including Chocolat! ) After canoeing, depending on timing we can either take the short route back to Sarlat or a longer route through Beynac. We dine in town again tonight. We leave Sarlat taking advantage of the network of reclaimed railway track now turned into smooth traffic free cycleways. We then cross the river to pick up some un-trafficked roads on the south side of the river, heading upstream to the market town of Souillac for lunch by the Romanesque Abbey-Church. The remarkable carvings on the church are well-worth a closer look, and a stop for coffee. A few kilometres after Souillac we reach Lacave. At Lacave we leave the river and head south, climbing through dramatic countryside to our overnight stop at Rocamadour. 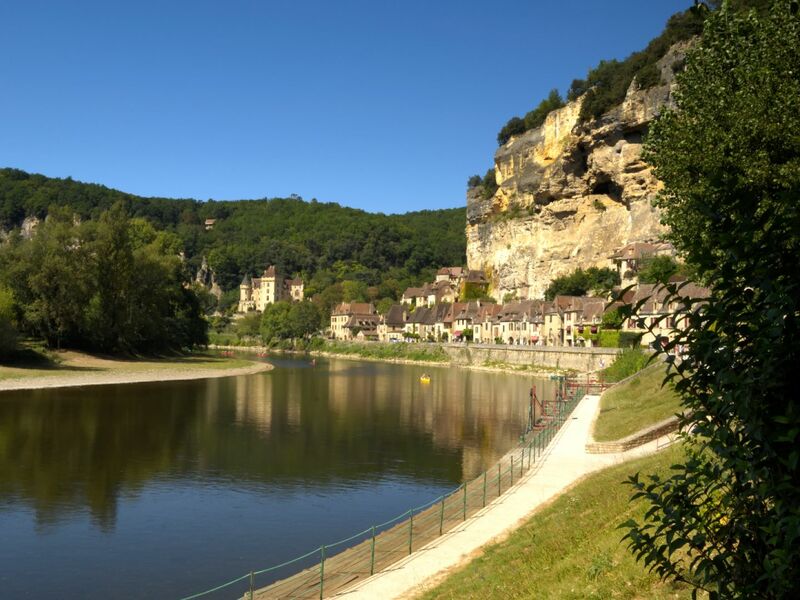 This spectacular village on the River Alzou has been a place of pilgrimage since the 10th Century, and above the town in the hillside is the Cité Réligeuse, where there are seven chapels. On our last day in the saddle we descend from the limestone plateau on which Rocamadour sits, and arrive at one of the highlights of the tour, the Gouffre de Padirac, a 75m chasm leading to a river flowing 103m underground. The underground journey is taken by boat and on foot. After descending to the river at the fabulous village of Carrenac, a UNESCO listed site, we rejoin the valley of the Dordogne and turn West towards our final destination in the village of Lacave, where our stunning hotel awaits with an enticing swimming pool and a spectacular gourmet restaurant! Breakfast at the hotel is a hearty affair, and there is a chance to swap e-mail contacts before we make our way home. Returns are to Souillac for direct trains to Paris. 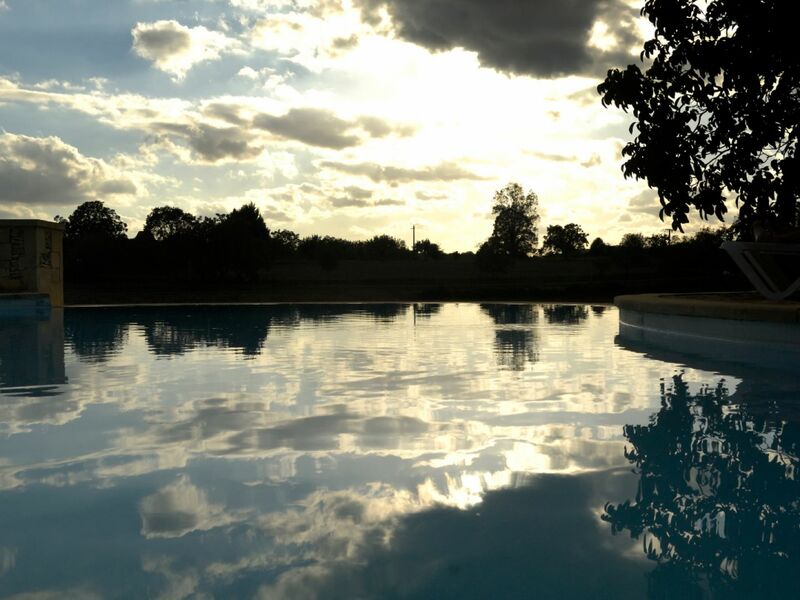 A simply stunning hotel set in grounds with pool and tennis court, parts of the Château date from the 13th Century. A gourmet restaurant complements this gem, a perfect setting to round off the tour. An ancient farm complex has been painstakingly restored to provide an oasis of calm in the rolling hills of the Dordogne. A very different kind of hotel experience, after a dip in the infinity pool you will be welcomed by Michel and Josiane for a home cooked dinner made with regional specialities. A typical perigourdine chartreuse (manor house) has been transformed into a beautiful hotel, set in extensive wooded grounds, minutes away from the hustle and bustle of medieval Sarlat. The 4* Moussidière has all modern amenities like wi-fi and air conditioning whilst keeping the charm of its old stonework. A swimming pool is a pleasant bonus in the heat of the summer. An authentic 4 star establishment situated in the heart of the old town. Located at the entrance of the medieval city with its listed monuments, markets and shops, numerous restaurants, street shows and performances. The Beau Site was formerly the Capitanerie of the Knights of Malta in the later middle ages. Now it is a charming 3 star hotel, retaining all the history of its ancient walls. In the heart of Rocamadour, the hotel’s stunningly situated restaurant overlooks the Alzou gorge where the local specialities of Quercy lamb and Rocamadour goats cheese feature highly on the menu. Set in a stunning location on the River Ouysse, this charming 3 star hotel is the perfect place to start our tour. Starting life as a medieval farmhouse, space has been reclaimed from the cliffs overlooking the river to create a wonderful inn. With a swimming pool for hot days, it's crowning glory is its Michelin starred restaurant!